This is an 18 Meter Roll of 6mm Tamiya Masking Tape. Retail $5.25 SAVE 20% ! Works perfect for making straight lines. I even cut it down to about 1/8 and did all the trim on a car, and had NO bleed through at all. Get it! 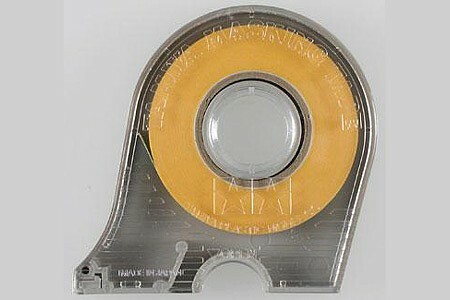 This is a thin, self-adhesive paper tape, developed for model applications. Easily applied to curved surfaces making it ideal for masking off areas for painting, etc. Comes in a plastic, reusable dispenser. Dispenser teeth cuts the tape to your desired length. "Tamiya Model Masking Tape with dispenser." I have been using this tape for a few years for everything from holding parts while I paint them and then stick them to a table edge while it dries, to holding parts together while the glue dries. But now I have the dispenser also. It makes these jobs easier and quicker. I use the 6mm and the 10mm. When you are using an airbrush sometimes you need a crisp line to define between two or more colors. The tape and dispenser is the way to go. I&apos;ve been using this since shortly after beginning modelling. It works great! The tape holds close to the plastic and thus prevents paint from seeping under the tape. It&apos;s thin, so one can use it in small spaces. It removes without residue. The case takes up hardly any space wherever it&apos;s stored. And the price is reasonable. Well worth your buy!